Munich offers winter-lovers a huge array of sports. While there are plenty of cozy recreational options in the city, there’s also no shortage of action-packed indoor and outdoor activities. In this article, we present some of the typical winter sports Munich has to offer. Once the temperature drops, the magnificent Nymphenburg Palace becomes a popular destination for people of all ages. Fortified with mulled wine or non-alcoholic drinks and snacks, visitors can practice their skills on one of the palace canal’s 40 lanes. Curling stones can be rented there. You’ll find a more relaxed alternative at the smaller curling lanes at Bamberger Haus. Here, visitors can curl in a little more peace and quiet on one of two lanes, which are situated next to a mulled wine chalet and a winter beer garden. An indoor curling lane is located in the KUFFLER California Kitchen. Up to ten people at a time can test their curling skills on the ten-meter-long lane. Mulled wine and punch are available at the KUFFLER winter chalet. Highlight: The Heißer Hut (“Hot Chalet”) in Bamberger Haus – the only place of its kind in Munich – is an excellent place to relax with friends after a round of curling. A fixed menu with your very own grill is a convivial option for groups of four people and over. Olympiaberg hill is perfect for young and old sledders alike, offering both gentle slopes and routes that are only suitable for experienced sledders. As well as providing stunning views, the Monopteros in the English Garden is a mecca for sledders. The Monopteros is located on top of the relatively small Rodelberg hill, which is particularly popular among younger sledders. Another popular destination for sledders is Teufelsberg hill in Aubinger Lohe, a beautiful local woodland. Aubinger Lohe also has several smaller hills, which are more suitable for children. The Westpark, which has numerous hills with different types of slopes, offers a variety of sledding options. 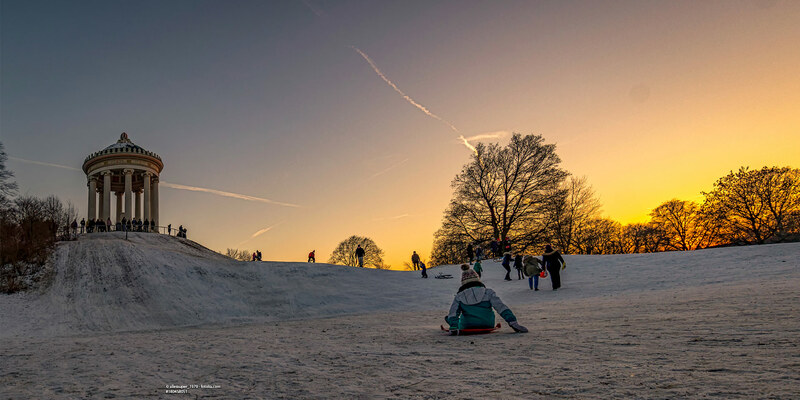 Highlight: If you like longer slopes, then you should visit the big sledding hill in the west of Westpark. Brauneck in Lenggries is a popular ski resort that’s easy to get to from Munich. Both beginners and confident skiers will enjoy a varied skiing experience here. With 34 kilometers of slopes, this resort is ideal for families. While children can be supervised by skiing instructors as they practice on the beginner slopes, parents can try out the slopes more suitable for their abilities. From easy through intermediate to challenging slopes, Lenggries has something for every winter sports fan. The ski racers Michaela, Hilde, and Annemarie Gerg, as well as the famous sister and brother Martina and Andreas Ertl, practiced here when they were children. The many chalets and inns provide a perfect place to wind down after a day on the pistes. Highlight: Flood-lit skiing down the Streidlhang slope is a very special experience. If the weather conditions are right, skiing fans can enjoy the piste from 7:00 to 10:00 p.m.
Ice skaters are permitted to use the public areas of the Olympic Ice Stadium, which is located within the popular Olympic grounds. The public skating sessions include a light show and the special “Disco Skating” evening program, where visitor can skate around the rink in time to the music. Ice-skating fans can enjoy floodlights and music as they glide across the ice at the modern outdoor rink at the Prinzregentenstadion. Next to the rink is a restaurant, where you can take a rest while enjoying a view out over the ice. In addition, visitors to the Nymphenburg Ice-Skating Club at the Hubertus fountain can skate across the Nymphenburg Canal, weather permitting. Here, too, visitors are provided with all the necessary equipment. Drinks and snacks are also available. The Eis- und Funsportzentrum West in Pasing offers an ice rink as well as sustenance in the form of snacks and drinks. If you don’t own your own skates, you can borrow some here. Highlight: Free ice-dancing instruction is available in the Prinzregentenstadion on Sundays between 10 and 11 a.m., with tips provided by experienced ice dancers. The high-quality one- to four-room condominiums in “PRISMA PASING” one of our new-build projects, will officially go on sale shortly. The project is located close to Nymphenburg Palace Park. The Eis- und Funsportzentrum West ice activity center is a three-minute bike ride from Pasing, while both Olympiaberg hill and Aubinger Lohe are just a twenty-minute car ride away. It takes around an hour and a half to reach Brauneck in Lenggries.